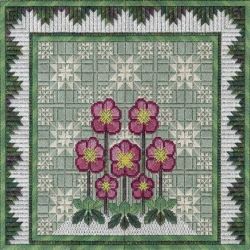 Design Area: 9.44" x 10.44" ~ Materials List: 14" x 14" 18 Ct Canvas, Sandstone ~ 14" x 14" Stretcher Bars ~ Japanese Tacks ~ #22 Tapestry Needle ~ Caron Collection Watercolours, 140 Blackwatch(2), 249 Geranium(1) ~ DMC #5 Perle Cotton, 647 Medium Beaver Gray(3), 822 Light Beige Gray(1), 3685 Very Dark Mauve(1) ~ DMC Color Variations #5 Perle Cotton, 4045 Evergreen Forest(2) ~ Rainbow Gallery Gold Rush 18, GD10C White Pearl(4) ~ Rainbow Gallery Silk Lame` Braid #18, SL11 Yellow(1). 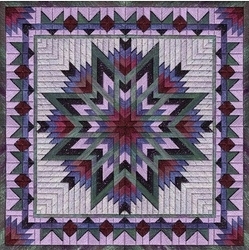 # in () indicates the number of skeins or cards needed. 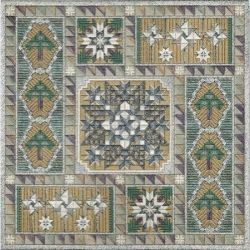 Design Area: 11.11" x 11.11" ~ Materials List: 15" x 15" 18 Ct Canvas, Sandstone ~ 15" x 15" Stretcher Bars ~ Japanese Tacks ~ #22 Tapestry Needle ~ Caron Collection Snow, 21 Storm(1 uses almost all), Caron Collection Watercolours, 151 Pewter(1), 259 Garden Path(2) ~ DMC #5 Perle, 501 Dark Blue Green(1), 612 Light Drab Brown(2), 648 Light Beaver Gray(1) ~ Kreinik #12 Braid, 011HL Gun Metal High Lustre (3) ~ Rainbow Gallery Gold Rush 18, GD5C(6), Rainbow Gallery Silk Lame` Braid #18, SL02 White(2). # in () indicates number of skeins, spools or cards needed.